Where can one get the storage cabinets? wANT TO know where to get these storage cabinets. overhead racks - what are the dimensions and cost? Company location - We are in Quebec province. Where's that company's showroom? Ceiling - Hello, what is the ceiling height of the garage? 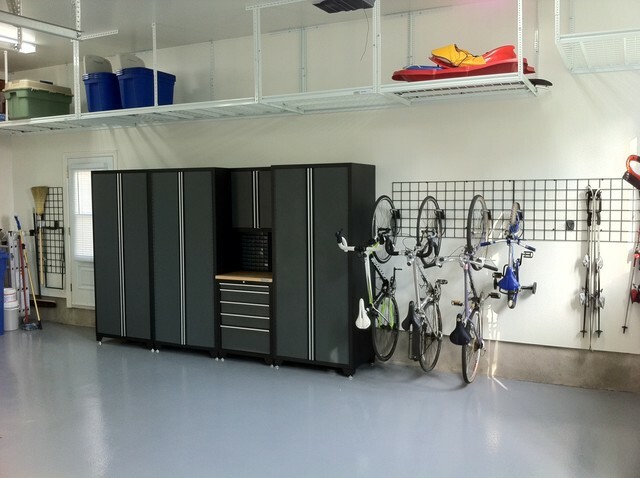 Three main types of garage storage to consider:Overhead. If you have a lot to store and space is tight, consider using overhead space to stow away some of your least-frequently used items (like holiday decor) in lidded bins. Overhead storage racks need to be securely mounted for safety, so it’s best to have a pro put them in.Wall-mounted. Keeping gear and bins off the floor is one of the best ways to prevent moisture damage and save floor space.Locked cabinets. These are essential for safely storing materials like antifreeze, motor oil, pesticides and other chemicals that could harm children or pets if ingested. Overhead. If you have a lot to store and space is tight, consider using overhead space to stow away some of your least-frequently used items (like holiday decor) in lidded bins. Overhead storage racks need to be securely mounted for safety, so it’s best to have a pro put them in. Wall-mounted. 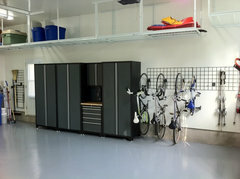 Keeping gear and bins off the floor is one of the best ways to prevent moisture damage and save floor space. Locked cabinets. These are essential for safely storing materials like antifreeze, motor oil, pesticides and other chemicals that could harm children or pets if ingested. locked garage cabinets for hazardous materials?